DXMarkets is a platform for investors to issue, manage and trade digital assets. The company additionally offers a range of blockchain-based services for financial institutions. Our founding team consists of Marcelo García Casil, Miguel Neumann and Federico Cardoso. Marcelo is our CEO and brings 10+ years of experience in financial technology, having built cutting-edge solutions for tier-1 investment banks including Barclays and Credit Suisse. Marcelo’s understanding of capital markets combined with his technical expertise puts him in a unique position to drive change through technological innovation in a way that is compatible with the financial world. Marcelo is a frequent speaker in the Fintech circuit and is considered a thought leader in the field. Miguel acts as our COO. His background in business and marketing operations, added to several years in the digital space complements the technical expertise of the team with a focus on strategy and product. As former J.P. Morgan employee, he was heavily involved in large-scale transactional platforms covering the whole investment lifecycle. Miguel’s academic credentials include studies in Marketing, Project Management and an MBA from Durham University. He is also a regular speaker in the European Fintech space. Federico, as the company’s CTO, brings 20 years of experience building and running large-scale enterprise-grade systems. He is particularly knowledgeable in areas of security, scalability and distributed ledger technology. DXMarkets activities are organised around two streams within Financial Technology Innovation: platforms and services. The Platform stream focuses on bringing the efficiencies of vanilla-type financial instruments into investment-grade physical assets characterised from market opacity or fragmentation, lack of liquidity and outdated models. Our platforms leverage blockchain technology and smart contracts to improve transaction speeds and efficiency. The Services stream engages in co-creation projects working alongside financial companies by developing and integrating blockchain technology into their transaction models. DXMarkets structured approach starts with a proof-of-concept to validate the business idea driving the project, allowing to then move into a fully-functional solution. In addition to these two streams, the company is regularly involved in workshops, hackathons and conferences organised by clients and industry bodies to support and promote innovation. 3/ What’s the founding story behind DXMarkets? 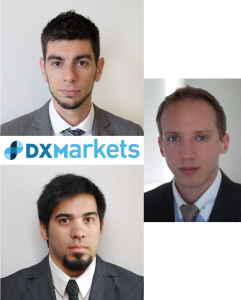 DXMarkets started with DIY crypto-currency miners working in spare rooms of our founding members across three continents. The idea quickly evolved into a marketplace, then pivoting into a business solution based on the underlying technology architecture of cryptos: distributed ledgers. Since its inception, the team has been geographically-distributed, perhaps coincidentally mirroring the technology’s architecture itself; it was evident for the founders that the potential of using blockchain to redefine the financial services industry was enormous – much more so than cryptocurrencies themselves. For most of us it has been extremely satisfying to participate in events alongside immensely respected and successful companies. In addition to Notz Stucki, we shared stage with SIX, Nasdaq, Deutsche Bank and many other prominent global investment institutions, in addition to extremely bright thought leaders in the fields of Economy, Finance and Technology. It is a humbling experience and something we all are proud of. 5/ What’s the vision behind DXMarkets? We believe in a financial world where transparency and fairness are leading principles. We see the distributed ledger technology behind blockchain as a disruptor powerful enough to be a game-changer and shift financial power and control away from the very few into a larger, healthier global market. We envision this shift been driven by efficiency and openness, on a levelled play-field where participants can transact and invest without being subjected to prohibitive fees or unfair market manipulation. At DXMarkets we believe in financial technology as an enabler for positive change both for existing incumbents and new players alike. Our biggest challenge is to be able to expand sufficiently fast to take advantage of the market opportunities, while remaining focused and efficient. Escalating a company quickly but orderly is a challenging task, but we’re determined to have the best people on board to ensure that our journey is successful. Entrepreneurship is where passion and pro-activeness overlap. Perhaps the words of Nutmeg’s CEO are something we find alignment with. I will paraphrase his closing remarks from a recent event in London: “don’t sit around thinking or asking others. If you have an idea, and you think is good… just go ahead and do it. Spend more time making things happen”. Previous Fusion has oppened the application process for the 2nd batch of startups!